Clifton Gaslight gets its beatnik-bohemian-intellectual feel in part from the many educational institutions that surround it. Within a mile walk is the University of Cincinnati, started in 1819 and ranked as one of the top public universities in the nation in areas such as cooperative education, pharmacy, medicine and law. Also close by is Cincinnati State Technical and Community College, which boasts the highly respected Midwest Culinary Institute. The Hebrew Union College houses The Klau Library (one of the most extensive Jewish libraries in the world), The Jacob Rader Marcus Center of the American Jewish Archives, a major center of study, research, and publication in the field of American Jewish history and The Skirball Museum, which features a permanent exhibition focusing on the cultural heritage of the Jewish people. Unlike most of Cincinnati's 52 neighborhoods, residents of the Clifton Gaslight District don't have to get in their cars or catch a bus to go about their daily lives. Clifton has long been where yuppies move to restore beautiful old houses and wealthy heirs live out their retirement in sprawling estates. 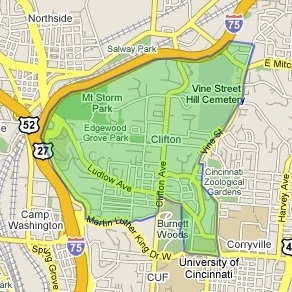 Still, Clifton is a diverse community, infused with youth, energy and intellectualism from the University of Cincinnati.